2015 Audi TT Roadster pricing, spec and on-sale date | What Car? 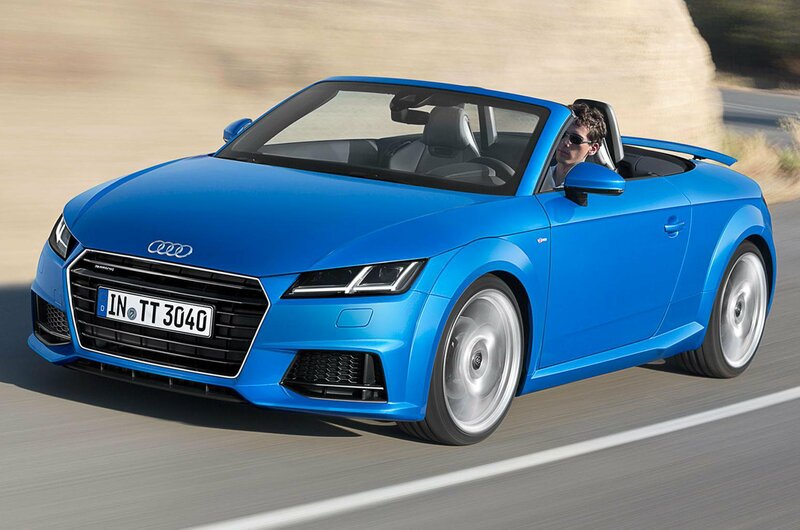 Orders are being taken now for the Audi TT Roadster, with the first cars being delivered March 2015. The open-top version of Audi’s all-new third-generation TT. Revealed back in October at the Paris motor show, Audi says it has focused heavily on ride comfort and making the car's body as stiff as possible, while trimming the weight over its predecessor, to 1320kg. Measuring 417cm long and 183cm wide, the new TT Roadster is 2cm shorter and 1cm narrower than the old car. No matter whether the electric fabric roof is up or down, boot space is 280 litres; that's 30 litres larger than the model it replaces, but less than the 335 litres of the BMW 2 Series Convertible. Two petrol engines are initially offered – a 227bhp 2.0-litre TFSI engine and a high-performance 307bhp 2.0 turbo TTS model, capable of 0-62mph in 4.9 seconds, that will join the range early next year. An economy-focused 2.0-litre TDI Ultra model will also be available, with CO2 emissions of 114g/km and claimed average fuel economy of 65.7mpg. The TT Roadster's fabric roof weighs 3kg less than the one on the previous TT, and can be opened and closed in just 10 seconds atup to 31mph. Audi also says that improved insulation has reduced the in-car noise levels by up to six decibels. The convertible version of the new TT will be offered in the same trim levels as the coupe equivalent. This means it will be in Sport, and S line, and is expected to come with the same equipment. This means the Sport will come with 18-inch alloys, leather/Alcantara sport seats, air-conditioning, DAB digital radio, Bluetooth, xenon headlights, and a retractable rear spoiler. The S line model will come with LED headlights and rear lights, S line badging, bumpers and side skirts, a gloss black radiator grille and 19-inch alloy wheels. Pricing for the new TT Roadster kicks off at £31,955 for the entry-level 2.0 TDI Ultra Sport, followed by the £32,045 for the 2.0 TFSI Sport. The addition of Audi's quattro all-wheel drive and S-tronic gearbox sees a price hike to £35,005 in Sport trim. S line trim starts at £34,505 for the 2.0 TDI Ultra and rises to £37,555 for the 2.0 TFSI quattro S line with the S-tronic gearbox. Pricing for the high-performance TTS is yet to be confirmed. It's hard to come by discounts on new roadsters, especially going into spring and summer. However, savings can be found on the Audi TT coupe variant, so it is possible deals will be available on the Roadster, possibly late next year, too.